My 12” iBook G4 is celebrating its 8th birthday today! Time for a little present. How about R 2.14.0? 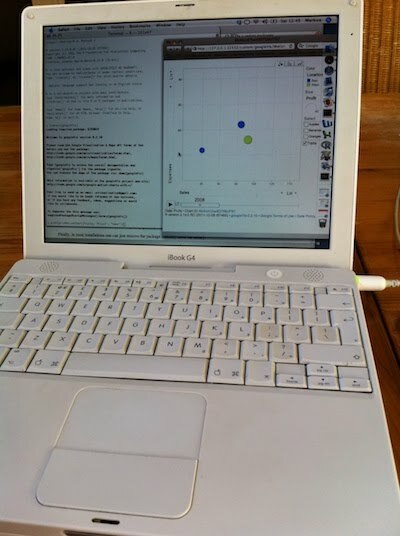 The iBook is still in daily use, mostly for browsing the web, writing e-mails and this blog; and I still use it for R as well. For a long time it run R 2.10.1, the last PowerPC binary version available on CRAN for Mac OS 10.4.11 (Tiger). But, R 2.10.1 is a bit dated by now and for the development of my googleVis package I require at least R 2.11.0. So I decided to try installing the most recent version from source, using Xcode 2.5 and TeXLive-2008. R 2.14.0 is expected to be released on Monday (31st October 2011). The pre-release version is already available on CRAN. I assume that the pre-release version is pretty close to the final version of R 2.14.0, so why wait? It was actually surprisingly easy to compile the command line version of R from sources. The GUI would be a nice to have, but I am perfectly happy to run R via the Terminal, xterm and Emacs. However, it shouldn’t be a surprise that running configure, make, make install on a 800 Mhz G4 with 640MB memory does take its time. Below you will find the building details. Please feel free to get in touch with me, if you would like access to my Apple Disk Image (dmg) file. You find my e-mail address in the maintainer field of the googleVis package. Before you start, make sure you have all the Apple Developer Tools installed. I have Xcode installed in /Developer/Applications. From the pre-release directory on CRAN I downloaded the file R-rc_2011-10-28_r57465.tar.gz. Just updated my R installation to R-2.15.0 and the above procedure still worked. But I had to be patient. It took at least an hour to compile R and the core packages. Just updated my R installation to R-3.0.1 and the above procedure still worked. The iBook will be 10 years old soon and is still going strong. Not bad for such an old laptop.